Nizamabad may enter Guinness Book with this!! Nizamabad may enter Guinness Book with this!! Nizamabad may enter Guinness Book with this!! 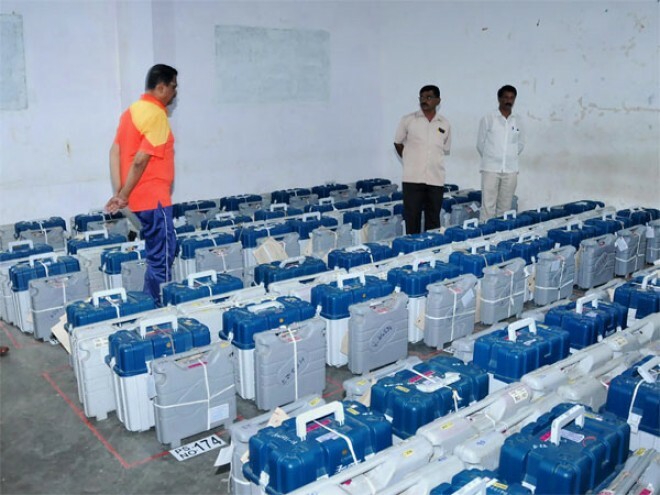 Nizamabad, Apr 12: The Nizamabad Lok Sabha constituency, where polling was underway on Thursday along with 16 other constituencies in Telangana, may make it the Guinness World Records for the maximum number of Electronic Voting Machines (EVMs) handled. With 185 candidates, a majority of them farmers, entering the contest, the Election Commission is using 12 EVMs in each polling station. The polling in this constituency began at 8 a.m., an hour after the process began in the remaining constituencies. "The polling is going on smoothly barring at two-three places where EVMs were replaced. In the first hour, 3.6 percent polling was recorded," he said. The EVMs of M3 version were arranged in 'L' shape with each machine carrying a maximum of 16 names. "It was a challenge as 600 engineers from ECIL and BEL and 1,200 other people worked day and night to make all the arrangements," said Rajat Kumar. The farmers also held a rally on the last day of the campaign and decided to vote among themselves to teach a lesson to the mainstream parties which failed to address their problems. The constituency has a little over 15.53 lakh voters including 3.73 lakh farmers . Telangana Chief Minister and Telangana Rashtra Samithi (TRS) chief K. Chandrashekhar Rao's daughter K. Kavitha is seeking re-election from the constituency. The Congress has fielded two-time MP Madhu Yaskhi Goud while D. Arvind is contesting on BJP ticket.